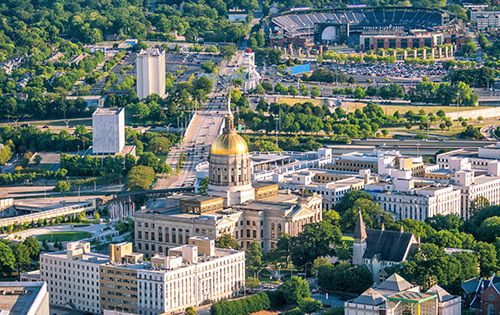 Having a humid sub-tropical climate, Atlanta’s weather ranges from cool, mild winters at around 43 degrees, to hot, humid summers around 85 degrees. The city finds itself in zones 7a and 7b of the USDA Plant Hardiness Zone Map. The City is known for its lavishly green landscape, thus nicknamed “City in a forest”. Atlanta takes care of, protects and values its trees. There are regulations and requirements governing the removal of trees from private property. Following is an excerpt from www.treeremovalpermit.com/georgia/atlanta-ordinance-permit-city-arborist/, which explains the Atlanta, Ga tree removal permitting process and requirements in detail. Fill out and submit a tree removal permit application. Applications can be mailed, faxed, emailed or delivered in person to the City of Atlanta Arborist Division (contact info on the PDF). Generally, within 5 business days, an assigned arborist will visit and complete a field inspection. When the application is approved, the field inspection report will be returned to you and must be on site while the tree removal process takes place. * In the event the permit application is denied, an appeal can be filed. A public hearing will take place where you can explain your situation. Contact Kathy Evans at (404) 330-6235 or visit atlantatreecommission.com for further instructions. The City of Atlanta Arborist Division is comprised of an Arboricultural Manager, Regional Inspectors, and Plan Reviewers. It can provide further clarification on the protection ordinance, removal permit, and tree density requirements. If you have a tree emergency or need assistance from a local tree service, we vetted a team of professionals to assist in the removal of dead, diseased, or hazardous trees.